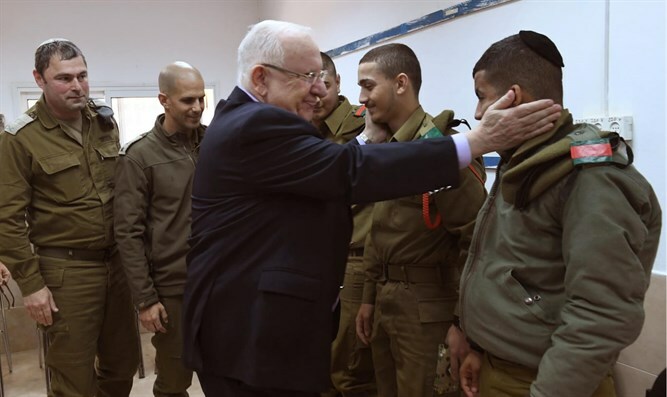 President Reuven Rivlin visited the IDF’s Havat HaShomer base this morning, Wednesday. The president was escorted by Head of the Manpower Division, Maj-Gen Moti Almoz and Chief Education Officer Brig-Gen Zvika Faireisen. During his visit the commanders of the base briefed him on how the IDF works to incorporate special populations. He toured the classrooms and took part in a final lesson of basic training, and then met with graduates, soldiers and officers of the base for a discussion. The president thanked the instructing staff for their work, saying “the commanders here today deal with some of the most complex educational and command challenges in a way that is truly inspirational. Your determination not to give up on any soldier – ‘no soldier left behind’ – the persistence, the mental resilience required from you when you are sowing and reaping seeds of hope, are an example to us all. We are proud of you! I am sure that the recruits also know that it is a great privilege to have commanders like you.” The president concluded with wishes that when he next meets the recruits, it will be at the ceremony on Independence Day for outstanding soldiers.